Painter says he's inspired by Chuck Close, Seurat, impressionism and most recently, graffiti. A Tom Myott original, which appeared on the cover of 'saratoga living' in 2017. Most art lovers — even the most cerebral and academic — turn to the medium for simple delight or deliverance from everyday cares. It would be hard to find a more unabashedly joyful expression of life than on canvases Tom Myott creates. 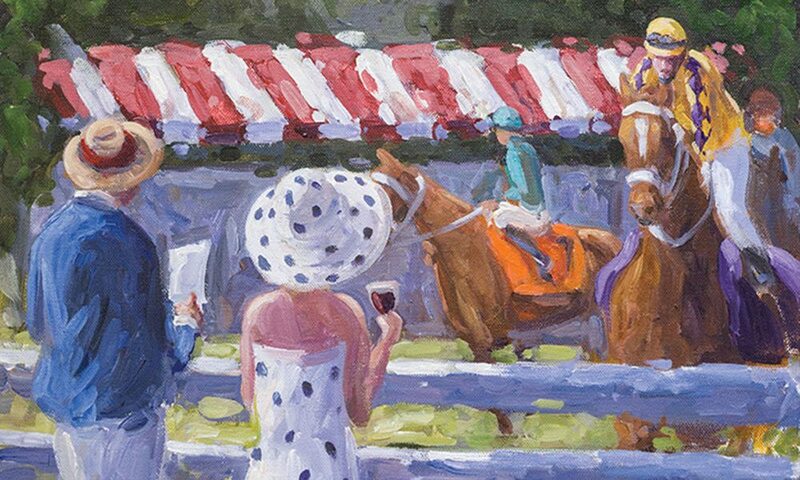 His eclectic portraits of horses and the Saratoga racetrack are well-known and sought after in the region. Inspired by Chuck Close’s grid style of painting, Seurat’s pointillism, the grand whirl of impressionism and more recently, graffiti art, his renderings of the horse life and its glorious ephemera are so much more than the sum of their parts. They reward close study and gazes from afar. But his work of late has taken an unexpected turn. “I’ve been doing a lot of driving recently,” Myott tells Saratoga Living Magazine. An art teacher at South Glens Falls High School, his summers ‘off’ are anything but. There’s the hectic world of festivals and art shows that he attends and exhibits at all over upstate New York. “I’ve been driving two hours a few times a week to see my mom, who is recovering from a broken hip in Hoosick Falls. I’ve been driving out to Vermont to hang paintings for clients and I’ve just been going where I need to be for shows,” he explains. From what could be a series of depressing or stressful drives, Myott has extracted a new artistic direction and a rich trove of source material for his newfound passion: landscape paintings. He says he pulls over several times during his drives to take pictures. While the stopovers delay his journeys, the inspiration they provide is well worth the extra time. Landscape painting seems antithetical to the vitality and fun his celebrated portraits of horses offer. But Myott’s acrylic renderings of land on canvas become as vibrant and brimming with life as the land itself. The spirit and heartbeat of the race course. The beauty and majesty of the Adirondacks. Tom Myott’s exhibit at Silverwood Home and Gallery (398 Broadway) launches July 20.